Thanks to the DocPath financing, the SMILe Research Team of the Castilla-La Mancha (UCLM) university has optimized this document management system. It Incorporates a new complex research technology in Data Base, by applying "fuzzy logic" techniques in the Research Engine. This research involves a milestone in the document management system environment. 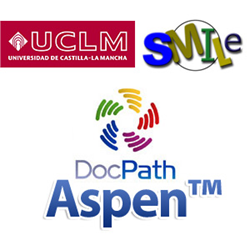 Between 21 and 24 of July, the SMILe Research Team (Soft Management of Internet and Learning) of the Castilla-La Mancha University (UCLM) will expose the main findings of the research and the development performed on the DocPath Aspen thanks to the DocPath financing. From 2013, DocPath maintains a contract of R+D+I with the SMILe Research Team with the aim of developing and improving the DocPath Aspen solution, by using Soft-Computing techniques and Artificial Intelligence. DocPath Aspen is a complete document management system, that allows the storage of the historical documents of a company and enables to search them via web. The SMILe Research Team, managed by the researcher José Ángel Olivas, will host an exposition under the title "Improving Business Processes Management Systems by Introducing Soft Computing Elements," to explain in detail the innovative results of the project in the document management software environment. Following the partnership between UCLM and DocPath, it has been possible to develop a new research technology in Database to use it in Document Management Systems by applying "fuzzy logic" techniques in the Search Engine. The technological updates have been integrated in the DocPath Aspen document management solution, and currently is undergoing tests with a high workload. 1-It allows searches from the terms automatically considered as relevant. 2-Advising, as "intelligent" mode, about the folder in which a document should be stored according to its content. 3-It enables document searches, through linguistic tags representing a relevant figure content. The 2014 World Congress in Computer Science, Computer Engineering, and Applied Computing (WORLDCOMP'14) is an international event, which from the year 2006, brings together researchers, academics, professionals and students to share all successful results of their studies. For more information, visit: http://www.worldacademyofscience.org. UCLM was created in 1982 and from the beginning, one of the aims has been to act as a fundamental tool for the economic, social, cultural and technological development of an Autonomous Community. The SMILe team has several research lines: Information retrieval on the Web with Soft-Computing Techniques; Development of internet Meta-search engines; Knowledge Management in groups and models (patterns) of learning; and Development of Systems Based in Knowledge, especially in the field of Prediction. For more information, visit: http://smile.esi.uclm.es/smile/. DocPath is a leading document technology software manufacturer. Created in 1992, its solutions are found in companies all over the world. Among its international clients, are prestigious banks and first-class corporations, which are aided by DocPath solutions by simplifying the complicated and critical task involving design and the distribution of documents. DocPath maintains a strong commitment to R&D&i, an area that receives a good amount of its revenue, and in which lies the key to the company's success. For more information, visit: http://www.docpath.com. DocPath is a registered trademark of DocPath Corp. All rights reserved. Other trademarks may be the property of their respective owners.